Click for bigger size photo. 4-th meeting of living ecovillages was finished in Russia. 4 days participants from 6 countries (Russia, Ukraine, Belorussia, Moldova, Latvia, Finland) take part in sections and presentations. There was representatives from 24 our eco-villages and Heikki H Attila from GEN Finland (25 totally). Due to fast growing number of eco-villages there was restriction: only participants permanently living in eco-village where live at least 3 families was invited. Maximum 2 participants from one eco-village was invited (~50 totally - see photo). There was participants from Sibiria to Moldova (6 hours time difference). Two videos with eco-villages self presentation (~9 hours) and practical experience presentations (~8 hours) are planned. Video from previous 3-rd meeting with self presentation of 15 living eco-villages can be found on http://eco-kovcheg.ru/video.html (in Russian, 7.5 hours, 786 Mb web version). More than 30 living ecovillages (with permanently living 2+ families) planned on next meeting. 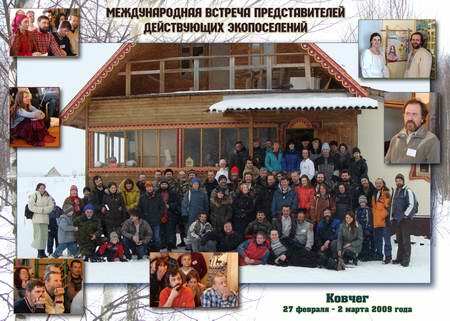 On february 27-March 2, 2009 the fourth annual meeting ecovillages from Russia and NIS countries took place in the Kovcheg ecovillage, located not far from Moscow in Kaluga region. This year the organizers of the meeting again invited representatives of the "alive", or functioning, ecovillages to the meeting. That means only those living in the communities where minimum two families were living permanently (the whole year long) could come to this gathering. This requirement emerged due, firstly, to the main goal of the meeting, which was sharing the experience between those who were actually living on their own lands in their villages, as well as summarizing and spreading this experience of creating ecovillage and establishing sustainable life in it. The other reason of such a restriction was the limitation of Kovcheg winter accommodation facility. Representatives of 25 ecovillages coming from 6 countries - Russia, Belarus, Ukraine, Moldova, Latvia and Finland, arrived to the meeting. First day of this four-day meeting was the day of arrival, first contacts and informal networking. The guests could communicate with each other either in the Kovcheg Common house, or during the excursion organized for those coming for the first time, or in three baths, as according to Russian traditions "one should first feed guests and steam them out in the Russian steam baths, and only after this ask - what they have come for." This time, the host of the meeting not only fed and steam out the guests, but also in the evening organized for them the beautiful concert, as Kovcheg is famous with their musicians and the choir. Second day was dedicated to presentations of the ecovillages. The participants who came for the first time presented their places, and those who were present the last year focused on the past year new results. Before the meeting the participants making presentations were asked to focus not only on they achievements and progress, but also tell about actual problems and the ways to solve them. For this, they get from the organizers a questionnaire with main questions to be reflected. Next day a new format of conducting the meeting was tested which were thematic presentations on concrete positive practices of the ecovillages (building houses, solving management and decision-making problems, farming, horse and livestock breeding etc). The last day of the meeting was that of summing up and sharing impressions in a circle. When summing up many participants noted that if compared with the last year, this year meeting was more informative, rich in news and interesting facts, which demonstrated some real achievements of this new form of community in Russia. The participants had opportunity to be acquainted to ecovillager's experience in house building, environment friendly technologies, farming, decision-making schemes, natural delivery, organization of the autonomous children education. For the first time the horse and cattle breeding experience was presented by four ecovillages. The Kovcheg ecovillage shared their experience in solving problems with cutting their nearby forests by forest companies (by persuading those companies to turn to the selective mode of cutting). Many participants noted that during such meetings they get inspiration from their associates, and especially from more developed ecovillages, whose experience help them to understand the right direction of their efforts and avoid possible missteps. In spite of very compact schedule of the meeting the participants could keep their clear minds and digest huge amount of information dues to big variety of presentation forms - from multimedia presentations to brief lyrical movies and simple laconic answers to questionnaire prepared by organizers to structure oral presentations. Two evening events also contributed to mind clearness and joyful mood of participants: the concert of Indian music and traditional Russian songs and dances party, which was conducted in the evening of Mardi Gras. The materials of two working days of the meeting will be reflected in a two-part detailed documentary (9-hour and 8-hour films) which will be in a free access for each interested person. Additional information available in Russian!